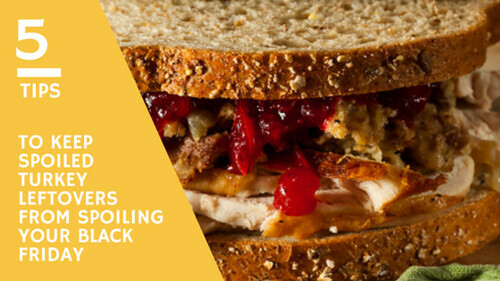 Turkey sandwich – 5 tips to keep spoiled leftovers from spoiling your Black Friday. It’s the day after Thanksgiving and all through the streets, 154 million consumers are moving their feet. All aim to get the best deal of the day, whether flat screens, jewelry or a 4K Blu-ray. But your next door neighbor missed all the cheap deals because his stomach was turning; it’s not made of steel. The Thanksgiving leftovers he went to devour were left on the table past 2 hours. The room-temperature food allowed bacteria to grow, entering his stomach as a terrible foe. A few simple steps could have saved him this fate, but now he must deal with a bad tummy ache. So we offer these five leftover tips to keep you from getting awfully sick. Follow these rules to keep your family healthy and let Black Friday sales keep your pockets wealthy. Keep food out of the Danger Zone: Bacteria grow rapidly between the temperatures of 40°F and 140°F. That is what is referred to as the Danger Zone. Hot food must be kept hot at 140°F or warmer to prevent bacterial growth. Within 2 hours of cooking food or from keeping it warm in a slow cooker or chaffing dish, leftovers must be refrigerated. Throw away all perishable foods that have been left in room temperature for more than 2 hours. Cool food quickly: To prevent bacterial growth, it's important to cool food rapidly so it reaches 40°F or below, which is the temperature of your refrigerator. To do this, divide large amounts of food into shallow containers. A 20-pound turkey, for example, will take a long time to cool, inviting bacteria to multiply and increasing the danger of foodborne illness. Instead, slice the turkey and place into shallow containers, so it will cool quickly. Wrap leftovers well: Wrap leftovers in airtight packaging, or seal them in storage containers. This helps keep bacteria out, retain moisture and prevent leftovers from picking up odors from other food in the refrigerator. Don’t store leftovers too long: Leftovers can be kept in the refrigerator for three to four days and then must be eaten or put in the freezer. They will last in the freezer for three to four months. Although the leftovers are safe indefinitely in the freezer, they can lose moisture and flavor when stored for longer times. Reheat safely: When reheating leftovers, be sure they reach 165°F as measured with a food thermometer. Reheat sauces and gravies by bringing them to a rolling boil. Cover leftovers when reheating to help retain moisture and allow the food to heat all the way through. Have food safety questions? Call the USDA Meat and Poultry Hotline at 1-888-MPHotline (1-888-674-6854) to talk to a food safety expert. You can also chat live at AskKaren.gov, available from 10 a.m. to 6 p.m. ET, Monday through Friday, in English and Spanish.